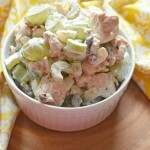 This is yummy chicken salad recipe is made with with green grapes, cranberries and walnuts. A superb flavor and texture combination to drive your tastebuds wild! Lately, I have been trying to eat lower-carb lunches. I am a self-proclaimed “carb-aholic” that has been sticking to higher protein meals. Let me tell you, it is not so easy!! 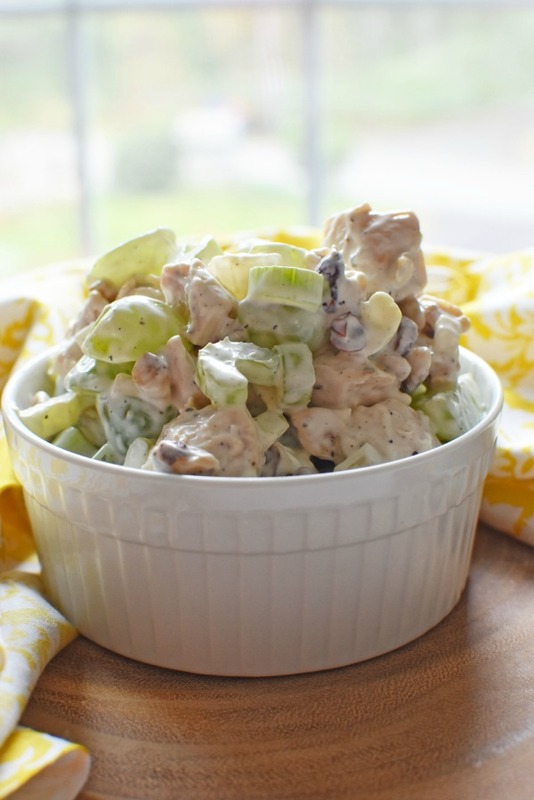 This delicious chicken salad with grapes is a perfect lunch or side dish. The combination of sweet and savory flavors and mixture of textures make this chicken salad stand out. Surprisingly, my whole family loved it, and I hope yours will too! The key to making a great chicken salad is to add fun ingredients to balance out the flavors and texture of the dish. You can use either green or red seedless grapes in chicken salad. I chose to use green grapes in this recipe because (honestly) they were the ones that were on sale at the grocery store! Grapes provide an extra boost of moisture and sweetness to a chicken salad. Make sure you at least slice the grapes in half. If they’re large grapes, it’s better to cut then into quarters instead. In addition to grapes, walnuts and dried cranberries are also great additions to salads. Walnuts add a satisfying crunch, while the tart dried cranberries balance out the sweetness from the grapes. Print this Chicken Salad with Green Grapes, Cranberries, & Walnuts below because it is going to be a keeper! A sweet and savory chicken salad recipe that features pan-fried, seasoned, white meat chicken, green grapes, walnuts, and dried cranberries. Season the chicken breast with your choice of seasoning. I prefer sea salt and ground black pepper. Pan-fry seasoned chicken for 7-10 minutes until clear juices run free. Carefully slice into the meat to make sure it is white and not pink. In a large bowl, add grapes, cranberries, walnuts, onions, and celery. Add in pan-friend chicken and toss until everything is coated. Place in refrigerator for at least 1 hour to chill. Serve alone or with some greens. That sounds wicked tasty! I eat A LOT of chicken salad, but I have never had it like this. Yum. This is one of my most favorite meals at lunch! I love to make it all the time. The green grapes make it just the right tang! i could just dive into your salad! That looks amazing, and I absolutely LOVE that you added grapes and cranberries to it! That sounds so good! I love the flavors you chose for this chicken salad. It sounds so fancy! I love the addition of grapes and cranberries in this salad. It gives it just the right amount of sweet. Sounds awesome! Yum, that reminds me of a salad my Grandma used to make for family events. Will give it a try soon. Oh this sounds delicious! We are big fans of chicken salad. I could see enjoying this on a croissant. I have been wanting to try the Freshworks containers and see what I think. Everyone I know who has tried them said they worked fantastically. Your chicken salad recipe reminds me of the kind I used to have when I was little. Brings back great (and yummy) memories! Ooooo…. I have a love affair with food storage containers! 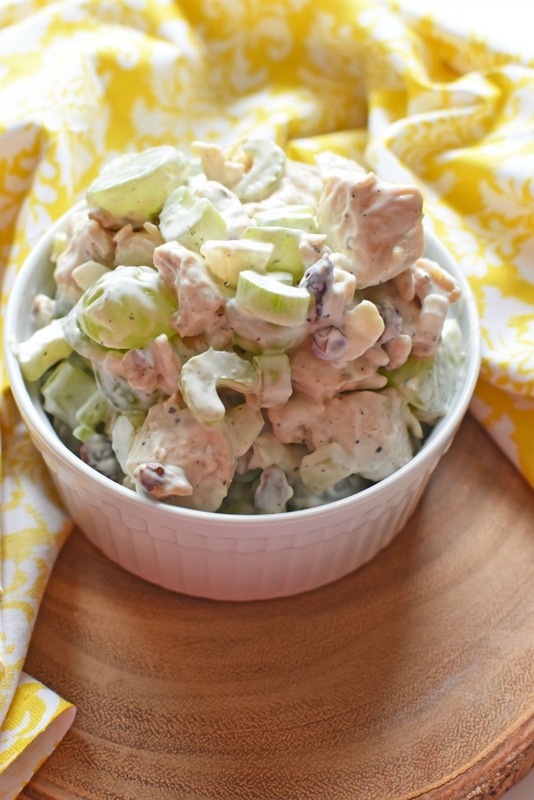 And your chicken salad… it simply screams holidays! Oh this sounds delicious! I love being able to use fresh produce in fun new ways. Awesome idea! This recipe looks so delicious and easy to make. I will have to get the ingredients I need to make this on the weekend. I am sure it will be a big hit. I love those Rubbermaid tubs! They’re so handy! That chicken salad sounds delicious. I haven’t had my own in a while! That salad sounds amazing. I love these Rubbermaid containers as well. I own some of them and they’re great. This chicken salad with green grapes look delicious! I have had chicken salad with red, but not green grapes. I love Fresh Works products. They work great. And this chicken salad looks yummy. Chicken salad is my favorite! I am loving this recipe! Add in some celery and you’ve got a believer in me! I love fancy chicken salads! I’ve seen these at the grocery store and wondered if they really do work. I’m so glad to hear they do because veggies always go bad at our house and there’s nothing else I want more to keep – especially for snacks for the kids! What a tasty salad! I love a good salad that will fill me up and this sounds like the perfect one. This salad looks SO good! And I love how easy it is to make!! I would store Strawberries and salad.